I saw something both amazing and shocking. In barely a few seconds my understanding of nature and my view of the world changed. What I saw on that afternoon, warm and sunny, in late spring, riding up a long hill on my mountain bike, out of a small river valley to a plateau, going home from work, was curled up quietly on the ground in the shade of a large Spanish oak tree and covered in blood. 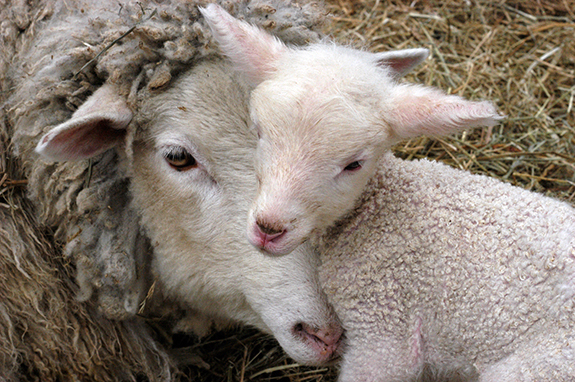 It was a newborn lamb. I was so moved, I stopped on the other side of the path a good distance from the baby and its mother, and watched. Within a few seconds I noticed that the mom had a bunch of bloody tissues hanging from her behind, dragging on the ground, and that she was so seemingly bothered by it that it was consuming all of her attention. The little lamb was lying still, and I couldn’t tell how well it was, because even though it was breathing, it wasn’t moving. But the mother was busy dealing with what was surely hanging placental tissues. What she did at that point is what shocked me: she ate the placenta and all the bloody tissues that were hanging from her. She swallowed it all up in less than a minute. That was hard for me to process. Sheep are vegetarian animals, herbivores just like goats, cows and horses: they just eat grass, bark, small fresh branches and things of this kind. I was shocked by the sight of it, but also by the clashing of my understanding of what it means for an animal to be herbivore and yet eat all this fleshy tissue and blood. How could it be? What did it mean? But what else could she have done? The immediate realisation was obvious: all animals giving birth to babies, across the natural kingdom, whether herbivores or not, and maybe even especially herbivores, must do the same when their babies are born: they must clean everything up, and this includes eating all leftover tissues, and licking themselves and the babies clean to leave everything as traceless as possible to avoid alerting any other animals, most importantly predators, who tend to be carnivores with an exquisitely refined sense of smell, particularly for fresh blood and flesh. What an incredible experience. This surely would not have seemed so amazing or incredible to most people a century ago, but to the eyes of a city-born, city-raised, city-living, city-dweller like me, it was amazing and it was incredible. The images from the scene I had witnessed by accident and by chance kept coming back to the forefront of my attention again and again for several weeks afterwards. Naturally, every time I rode by there to and from work, but also somewhat randomly at different times during the day, both at work and at home. It was for me an experience that revealed something profound about the natural order of things. And this triggered a cascade of small realisations about a whole bunch of things I had read over the years that highlighted connections between them and in relation to what we are, as humans, and what we need to be strong and healthy. This is what I want to share here, but will do so in a few parts. Being vegetarian is kind of like being a human herbivore but not quite. Being a vegan is certainly closer to it, but even that doesn’t correspond to it completely. One would have to be a raw food vegan to be as close as a human can be to a herbivore. There are millions of vegetarians around the globe, especially highly concentrated in traditionally non-meat-eating places like India. There are also plenty of vegans, but a lot less. And there are raw foodists, some of which eat animal products and meat, and some that don’t. There are fruitarians that restrict their food to only fruit, typically eating mostly sweet fruit (as opposed to low-sugar, fatty fruit like avocados and coconuts). On the other end of the spectrum, there are also people who eat only animal flesh, or only red meat, or only fish, and we can be sure that there is a wide range of diets that are more or less restrictive and more or less extreme, all based on various ideas, beliefs, but also intolerances or pragmatic considerations of necessity and circumstances. The reasons for which we adopt various diets, restricted to different degrees, are without a doubt even more varied than the diets themselves. I chose to stop eating meat for the first time when I was in high school at the age of 16, and remained vegetarian for over 20 years, with a few rare exceptions (like for example while travelling in Iran and not being able to find for periods of days anything other than white rice, baked tomatoes and kebab). Not only did I not eat meat, but I also rarely ate eggs and butter for at least the first 10 years, because, as we all “know” and so many continue to believe from years of brain washing and misinformation, these high-fat, high-cholesterol foods are dangerous for our health. This is false, of course, but whatever. Hence, I ate as many vegetarians do: lots of sweet fruit, hearty breads and muffins, and some nuts or seeds during the day, and typically pasta or rice with vegetables at night, always keeping fat low and carbs high, but also, unfortunately, protein very low. I sometimes made lentils, kidney or lima beans on weekends. I believed—I was convinced, of course—that I couldn’t have done better for my health. I kept that up through most of high school and all of university. After my first degree, which for me lasted five years, and after a year of travelling from Europe to Nepal overland, with much increased awareness of environmental issues, I came home and joined several food groups promoting local, sustainable, organic farming on small scales and seasonal eating in accord with regional climate, and learned about the “health benefits” and “virtues” of whole grains and cold pressed polyunsaturated vegetable oils. This is what became the essence of my diet: whole grains and beans, whole grain sourdough breads, plenty of cold pressed vegetable oils, farm vegetables, both cooked and in salads, unrestricted amounts of fruit, and some cheese, butter and eggs, everything from local farmers. Living in Ottawa with its super hot and humid summers and its frigidly cold and snowy winters, for most of the year vegetables were mostly roots, tubers and squashes (potatoes, carrots, beets, turnips, cabbage and squashes in all possible colours and forms), and fruit were basically apples and pears. I had read such convincing literature on the health benefits and therefore importance of unrefined polyunsaturated vegetable oils from sunflower and safflower, pumpkin, sesame and grape seed, hemp and flax seeds, all cold pressed and organic, of course, that I poured them liberally over all salads, grains, beens and breads. Now I was really convinced that this was the best I could do for my health. And convinced as I was of the excellent quality of all these foods, which was indeed excellent, but also convinced of their amazing health benefits, expositions and explanations of which were found in practically every health book, magazine and radio or TV health shows, how could I not wholeheartedly adopt this way of eating recommended by all these “experts” as the most healthful, seemingly based on scientific evidence and solid reasoning, and not also teach those around me by example and through explicit recommendations? This was to define my diet, and, from the spring of 1997, our diet with my wife who had also been a long time vegetarian. When our son was born in late 1998 we even more enthusiastically embraced this way to feed ourselves and our baby. He was breastfed for a year and a half, exclusively for the first six months, and then gradually less, smoothly over the next year. Fortunately for him, his first food at 6 months of age was avocado, an excellent high fat, moderate protein, very low carb, raw and enzyme-rich fruit that would be nourishing and easy to digest and assimilate. That was a great choice suggested by our naturopath at the time. He gradually transitioned to eating basically what we did—whole grains, beans, veggies and cold pressed oils—only for him, they were blended into a puree. Also fortunately for him and us, because some of our local farmers made fresh butter and cheese, and sold fresh eggs from freely roaming hens, we ate more of these foods. And, of course, they were delicious, nutritious and satisfying, but somehow I still felt that we were straying from the ideal diet that would be devoid of those high fat and high cholesterol animal foods. This is how we ate, and four more years passed before we moved to Paris. In France, delighted to be living in a place with a food culture that greatly values fresh, locally grown and hand crafted foods, we continued another four years basically eating as we had done in Ottawa, but with more greens and leafy veggies throughout the year, and more fresh butter, cheese and eggs, still with just as much whole grains. A diet that, according to most natural health experts, aficionados and professionals, was ideal: a diet based on different kinds of whole grains (spelt, kamut, millet and quinoa which was our favourite) served with oil and soya sauce, and different kinds of whole grain breads (wheat, spelt, kamut and rye), toasted and crispy, sometimes dressed with crushed garlic, oil and salt, sometimes with tahini and feta cheese, sometimes with almond or peanut butter, all of these whole grains and breads always so incredibly delicious, and best of all, so we thought, excellently healthy and good for us. Once or twice a week we would buy warm, sometimes steaming, traditional sourdough baguette, super crunchy and crispy on the outside and super moist and chewy on the inside, that we would often have with butter, radishes and salt (and what a treat that was). We always had with our evening meals large leafy green salads, or grated carrots and beets, or thinly sliced red or green cabbage, accompanied by fresh goat cheese. A couple of times a week we would have eggs. Every day we had fruit, always in accord with the season: cherries came first, then strawberries, then plums, then apricots and peaches, then melons and watermelons, then grapes, and finally apples and pears, which were also here in France our standard fruit during the winter. No refined or commercially made foods of any kind, everything local and organic, no junk food, no sweets, no sugar, unpasteurised honey sometimes, and desserts on very special occasions like birthdays or other celebrations. Many would think that this was all pretty incredible, fantastically healthy, even. You, readers of this blog, surely know much better than to think that by now. But I think sharing the details of the realisations that were triggered by my witnessing of the birth of the baby lamb and the mother’s eating her own placental tissues, together with the details of this twenty year experience, with explanations of the effects and consequences that I have since understood to have been caused by this apparently excellent, whole, unprocessed food diet, some deficiencies with which I am still struggling to this day, might be of interest and useful for other people who are concerned about what they eat, and are possibly following any one of the large number of different diets promoted for their particular virtues and health benefits over other diets promoted by other people. We will begin this exploration in the next part.